Products > DonnyFL Suppressors > Sumo 1.6" x 6.25"
THIS WILL BE BY FAR YOUR FAVORITE LDC. WHY SUMO? Latest model with swappable rear endcaps. Take apart in less than 10 seconds by unscrewing the rear end cap and pushing back the mono-core. No silly hex key or torch needed when you want to perform maintenance inside the unit. 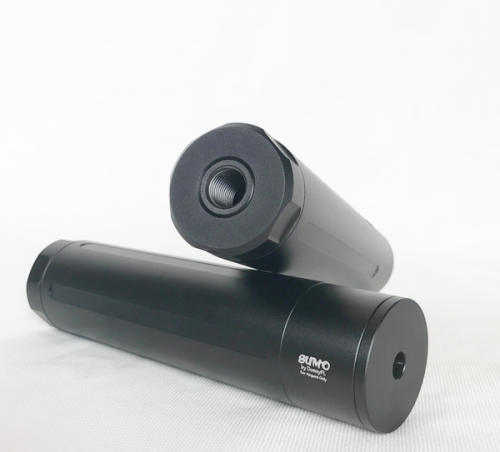 Customizable, you can further dampen the sound by wrapping the interior tube with different sound absorbing materials. Machined grooves on the outside for easy handling. *Note: If you see white lines on the inside of the front cap, that's ok. Those were caused by the prongs holding the pieces while anodizing. They are not pellet clippings.